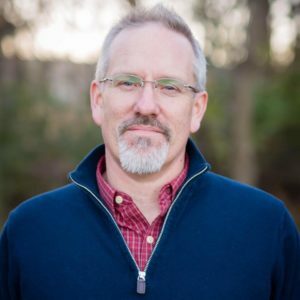 Derek Vreeland is the Discipleship Pastor at Word of Life Church in St. Joseph, Missouri, where he is known for his thoughtful, humorous, and authentic teaching style. In addition to teaching and leading discipleship ministries at Word of Life Church, Derek enjoys reading, writing, running, and hiking. He and his wife Jenni live in St. Joe and they have three boys Wesley, Taylor, and Dylan. He is a graduate of Missouri Western State University (B.A. English/Writing), Oral Roberts University (M.Div. ), and Asbury Theological Seminary (D.Min). His first book, Shape Shifters, combines his love for the doctrine of the Trinity and spiritual transformation and his second book, Primal Credo, offers a fresh reading of the Apostles’ Creed for modern followers of Jesus. Derek found a whole new audience with his popular summary guides to books by N.T. Wright including Through the Eyes of N.T. Wright: A Reader’s Guide to Paul and the Faithfulness of God and N.T. Wright and the Revolutionary Cross: A Reader’s Guide to The Day the Revolution Began. Derek was born in Mobile, Alabama and grew up in St. Joseph, Missouri. He was baptized in January 1986 marking the beginning of his Christian journey. While in high school in the early 1990s, he began to take his baptismal identity seriously and pursue Jesus with a new found intensity. Sensing a call to ministry, he threw himself into the life of the church and Bible study. His love for Jesus, Scripture, and the church continued through high school and into college. After a year of marriage, he began seminary at Oral Roberts University, graduating in 1999. In September of that year, Derek moved his family to Americus, Georgia where he served as the Youth Pastor at Cornerstone Church until 2004, when he became the Pastor. He completed a doctor of ministry degree from Asbury Theological Seminary in 2007. He continued to serve Cornerstone Church until June 2011, when he joined the leadership team at Word of Life Church. He is an avid runner and a super fan of the Kansas City Chiefs. He enjoys backpacking and long-distance hiking, and has a curious fascination with the Appalachian Trail (AT). He hiked the first 100 miles of the AT for his 40th birthday. He contributes regularly to the writing collectives at Missio Alliance. He loves his family and serving the church through teaching, writing, and speaking wherever God opens the door.